Myanmar, also known as Burma, is located in Southeast Asia. The country has a tropical climate with three seasons--rainy, hot and cold. The temperature ranges from 68 degrees to 95 degrees Fahrenheit throughout the year. Although native teak and mangrove forests have been decimated in recent years, both trees, along with the palm, are still found growing in the country. 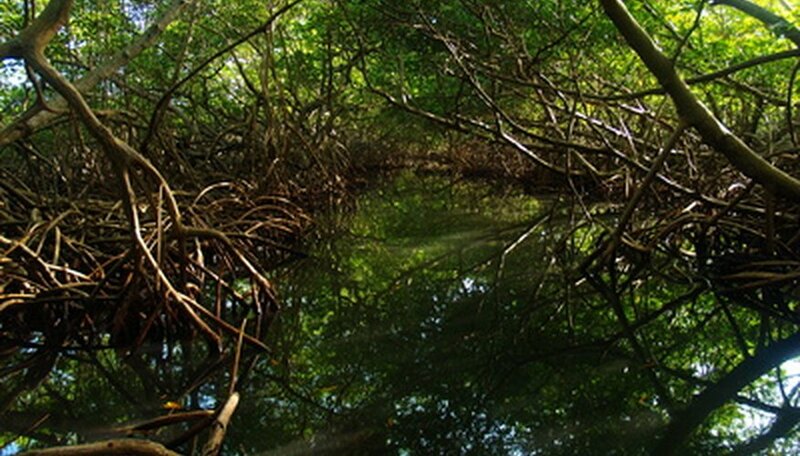 The Asiatic mangrove tree grows throughout Myanmar. The tree grows right to the water, forming extensive, stilted root systems that support the tree in both sand and mud, according to Purdue University. The tree reaches a height of 80 feet. The tree develops from seedlings formed on the tree. If the seedling fails to take root after dropping, it will float in the water for up to a year until it can gain a foothold in the sand. The bark is dark brown to black and grooved. The green leaves are an elongated oval shape with a pointed tip. The fruit is oval shaped and is edible. The flowers are white or yellow and grow in clumps of three to five. The timber of the teak tree is used for furniture construction, ship building and flooring. The wood is resistant to the fungus that causes wood rot and is used extensively for seaside construction. The tree grows to a height of 115 feet. The trunk is straight. The light gray bark is scaly, soft and peeling, according to “The Illustrated Encyclopedia of Trees of the World." The green leaves are rough and leathery and 32 inches long and 16 inches wide. The flowers are off-white and bloom in the summer after the leaves emerge in the wet season. The fruit is brown or reddish purple. The fishtail palm is a multistemmed palm with leaves that resemble fishtails. The tree grows to a height of 30 feet and is an understory plant, which grows underneath the tree canopy in the rainforests of Myanmar, according to Floridata.com. The diameter of each stem is 4 inches, and the glossy dark green, triangular leaflets grow to 7 inches in length along the stems. When each stem reaches its full height, the palm flowers and then fruits. The flowers are white. The fruit is dark red or black. After the tree fruits, the stem dies and new stems are formed.